It's Your Call is the second mission in Grand Theft Auto IV. 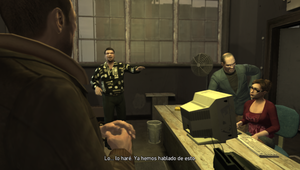 It is given to protagonist Niko Bellic by his cousin Roman Bellic from Express Car Service. Roman is trying to convince his girlfriend, Mallorie Bardas, that he likes her, while trying to get his employess to work through the radio. Then, Niko arrives and Roman introduces him to Mallorie and Vladimir Glebov, a man Roman owes money too and who warns Roman he should pay his debts, flirting with Mallorie at the same time. Roman asks Niko to drive him to the hardware store on Dillon St in Schottler. Along the way, Roman reveals that the hardware store is a front for a back-room gambling racket. He also reveals that the money he's using to play is money that he owes to the Albanian loan sharks. Upon arriving, Roman gives Niko his old cell phone, with his new phone number already programmed into it. He asks Niko to serve as a lookout and watch for the Albanian loan sharks in a beige Willard, and to call him if they arrive. He also warns Niko not to hurt them. Niko waits in the car while Roman enters the hardware store. After some time, the Albanians show up and Niko calls Roman to warn him. Roman runs out of the store and quickly gets in the car. Niko speeds off to lose the Albanians, who give chase and shoot him. After losing them, Roman says he lost this time and explains to Niko that they are at the bottom line and it is the Russians who control everything. When they arrive to the depot, Roman runs in and tells Niko to enjoy his new cellphone. The player earns $30, the cellphone and unlocks the next mission. Before you trigger the first mission for Roman, the door of the card room is always open (you can find people here) and you can go inside. After you trigger the mission its closed forever in the single player mode. According dialogue with Roman after the game, books of Steven Jabowitz he read didn't help him to win in poker. If the police sees the loan shark shooting, they will pull him out of the car. The driver will then drive away, leaving the shooter to get repeatedly shot at the police, but he has infinite health. Roman Bellic outside the hardware store. Niko Bellic warning Roman about the Albanians. The cell phone showing Niko phoning Roman. Niko and Roman driving away from the pursuing Albanians. This page was last modified on 12 January 2014, at 00:32.